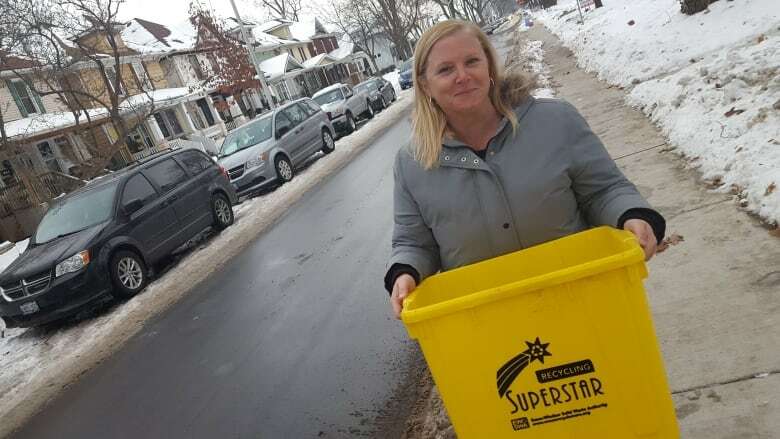 The Essex Windsor Solid Waste Authority launched a gold-star recycling pilot project this year, rewarding perfect recyclers with yellow bins. Special yellow recycling bins are being handed out to Windsor residents who meet the gold standard when it comes to recycling. School teacher Jennifer Daley Stewart signed up for the program and became one of about 100 residents to receive the new status symbol. "I was really excited, it came with a report card and I got an A+," she said. "It was really, really cool." Staff from the solid waste authority inspect the bins on collection day to assess how well people are doing. "I was out there, creeping people's curbs, with a flashlight, looking to see how they were doing," said Heather Taylor, a waste diversion specialist, describing the pre-dawn checks. "We did have a few people come outside, very happy, as if it was Christmas and I was Santa giving them an early Christmas present." So far, 186 people have signed up for the program. Since it started, 113 people have received what the solid waste authority calls "gold" bins. Thirteen people failed their inspection, while another 27 did not have their bins on the curb. Five applicants submitted the wrong address and another 28 homes have yet to be inspected. Putting plastic bags into the bins and mixing containers, such as milk cartons, in with paper recycling are the most common mistakes people make, according Taylor. Registration for the program will open again next spring.